They are a family of 6, mother bends her back under the sun working at someone else’s paddy fields, earning $3 a day. All 3 daughters were born with a disorder that took away their mobility, self-esteem and childhood. The girls moved around by hands and bottoms until they met us. A year later, the father was hit by the bus on the way home from work and died instantly. Year after that, the son had a motorcycle accident and is left disabled for life. All 3 were the beneficiaries of Hands For Hope Corrective Surgery Program in 2008. 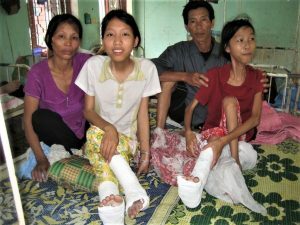 After the surgeries, they were able to walk on their feet, gained their dignity and independence and continued with schooling. The three sisters were awarded Hands For Hope Education scholarships and achieved many awards from school. Bé earned a degree in Management Information System (major in business statistics), graduated with honors in 2016. 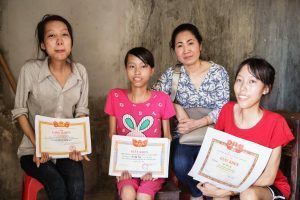 The oldest sister, Huong is finishing her Diploma in IT and the little sister, Yen, has just finished year 12. Their story is about pain, poverty, tragedy, hard work, determination, resilience, perseverance and how normal people like you and us can change their lives. The three sisters thank you by achieving many awards and doing excellent at school.